Several flares and coronal mass ejections between Jan. 19 (see last time graf 2) and 27 caused a lot of excitement and managed to enhance auroral activity at high latitudes but left observers farther away - e.g. in central Europe - waiting in vain. While on Jan. 22 at least the northern British Isles got a nice show, on Jan. 24 - covered in great detail by this live-blog with maaany links - the action remained restricted to around the regular auroral oval. The proton storm the latter CME caused was the strongest since 2003, but the - aurora-relevant - geomagnetic storm never exceeded a meager G1: This made the high-latitude aurora a bit more intense perhaps but it is practically always present, as most news coverage - as confused as ever - failed to point out. Here are links about an X flare on Jan. 27 (video, coverage, more, more and more) and C flares an Jan. 26, all ineffective. Earlier why the M9 flare on Jan. 23 and its CME didn't "work" for lower latitudes, selected high latitude pictures here (from a Hurtigruten ship), here, here, here, here, here, here, here, here and here, videos here, here and here and coverage here, here, here, here, here, here and hier. Finally the effects of the Jan. 19 flare on Jan. 22 were mostly covered in the live-blog; here are a nice picture, Norwegian videos of Jan. 22 and Jan. 21-23 - and documentation of auroral theft (the original pictured had been linked to twice in the blog) ... More solar-terrestrial links: new efforts in forecasting, an interview on space weather effects, a guide for aurora in Germany, solar wind predictions, the Kp value plotted for Jan. 22-24 (and during a real storm), the lack of solar cycle effects on climate demonstrated during the past minimum, the apparent non-role of the Sun in the Little Ice Age (blame it on volcanos; more and mehr), sunspot physics details, near-Earth electron escape and high solar activity removing space junk from orbit. • Elsewhere in the solar system Uranus has crossed the celestial equator for good and stays north for 42 years now. • Jupiter on Jan. 26 and Jan. 25, Jupiter, Moon & Venus on Jan. 29 (deep; Finland at 62.5°N) and Jan. 27 (video; Slovakia at 48.5°N) and Mars on Jan. 28 (more) and Jan. 17. Minor planet Eros is in perigee today, the closest in decades! The parallax campaign is in full swing, with the object quick in the sky, also seen in this video and trail image of Jan. 29 - and it's changing its brightness quite a bit as the strange body rotates. • The tiny NEO 2012 BX34 came to within 60,000 km of the Earth's surface: pictures and animations here, here, here and here and stories here, here, here and here. • Plus the physics of lunar impact flashes, an Al Jazeera clip on meteorite searching in Oman - great science on TV at an unexpected place! - and a mini-paper on the Shiva crater candidate. In the world of comets the weird story of the "shy comet" P/2003 T12 (SOHO) recovered by STEREO now. • Images of comet Garradd of Jan. 31 (just hours ago; more), Jan. 30, Jan. 29 (dito), Jan. 26, Jan. 22 (dito) and Jan. 21. 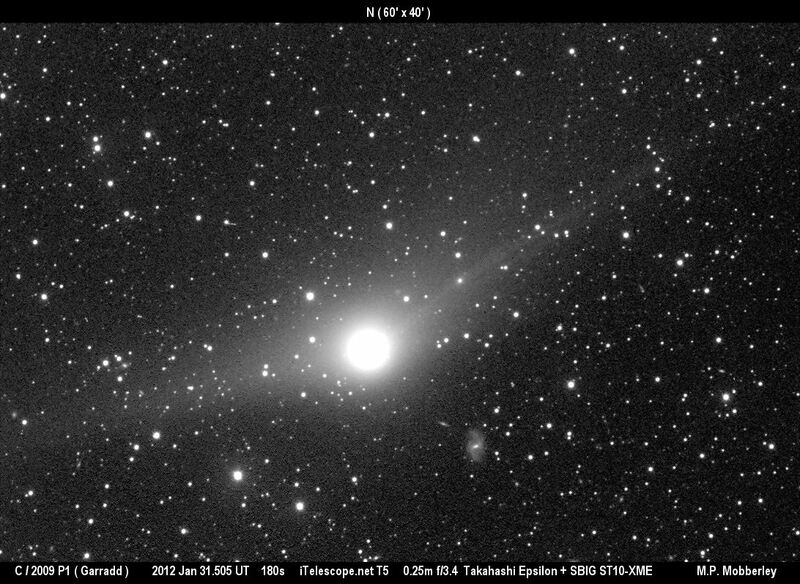 • Comet Lovejoy - here's a great picture collection! - is still there, with an exceedingly faint tail: pictures of Jan. 30 and Jan. 28 - plus a very tough sighting from New Mexico, also mentioned here. • Another article on the comet near the Sun last July. Sky highlights to be expected in February include the possibility to see all 5 bright planets in one night as Mercury begins its best evening apparition of 2012 in mid-month. There will also be a close Venus-Uranus conjunction on Feb. 9, and a star occultation by Quaoar on Feb. 17. • Finally a story on an amateur SN hunt (20 observers, 200+ successes), another analemma success, observations of a rocket fuel dump and a Yosemite timelapse movie with some astronomy from 2:20-3:20. Only under the best conditions is the long narrow tail of comet Lovejoy - still stretching for almost 40° - easily visible in the sky, elsewhere it isn't even a naked-eye object anymore: This Great Comet is only a shadow of its former self. Still photographs (exposed for several minutes) continue to show an amazing object, and the fading tail might get even longer by mid-January, though some image enhancement techniques will be necessary to bring its full length out. Some picture collections by Tabur, Garradd, Gerry, Mattiazzo and Hao (more, more, details) from Australia, pictures from Argentina and an undated one. Selected views of Jan. 1 (more, more and more), Dec. 31 (more and more), Dec. 30 (more, more, more and more in weird projection), Dec. 29 (more), Dec. 28 (more, more, more, more and more), Dec. 27 (more, more, more, more, more, details, more, more, more, more, more, more, a rise video and an ISS view, alt. ), Dec. 26 (more and Dec. 21 ... 26), Dec. 25, Dec. 23 and Dec. 22 (in an all-sky video). Also visual reports from Jan. 1 (still 39° tail), Dec. 31 (no longer naked-eye), Dec. 30 (earlier) and Dec. 27 - and coverage of Jan. 1, Dec. 31, Dec. 29, Dec. 28 (dito), Dec. 27 (down; dito, dito) and and Dec. 26. 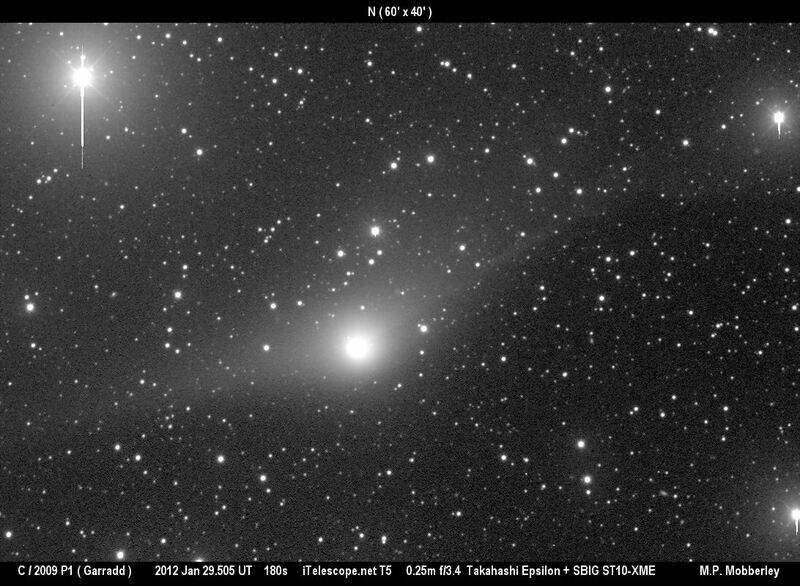 • There are also two new Boattini comets, P/2011 Y2 and C/2011 Y3. Heavenly highlights in January 2012 - see also hier & hier - include an asteroid transit in front of Betelgeuze (with the star's disk x10 larger than the asteroid; can that be observed?) on Jan. 2, the Quadrantids peaking on Jan. 4 (more & more) and a rare Earth approach of asteroid Eros on Jan. 31: This has led to a call to capture its parallax as a reenactment of a famous technique to measure the AU; concrete details are still being planned. • For the full year 2012 some highlights, what the planets and meteors have in store and what will be occulted by the Moon and minor planets; also a list of planet occultations by the Moon in 2012 and beyond. • Finally a helpful website about the state of space weather, some results from the Eps Aur event - and a FAQ, story (more, more & more), another video, TV coverage and all kinds of stuff (later, still later) about the Dec. 24 Soyuz upper stage reentry over Europe.